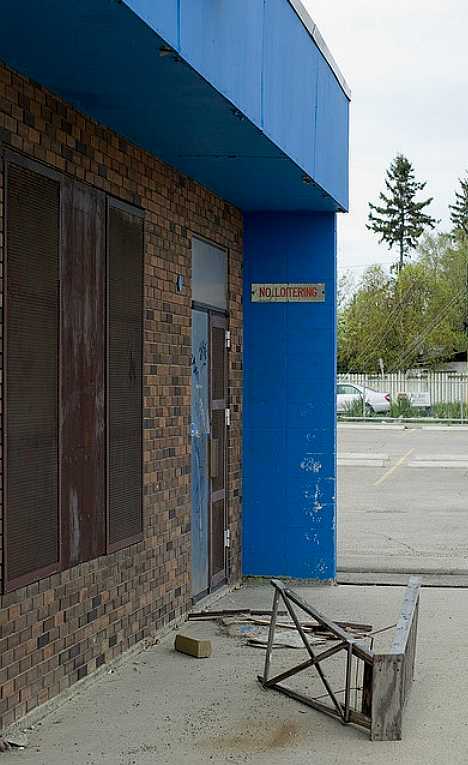 These abandoned roller skating rinks once saw social interaction mesh seamlessly with healthful recreation backed by a toe-tapping musical soundtrack. Pretty much all that remains of the former Starlight Roller Skating Rink and outdoor dance hall are the bandshell, ticket booth and concrete outdoor “dance floor”. 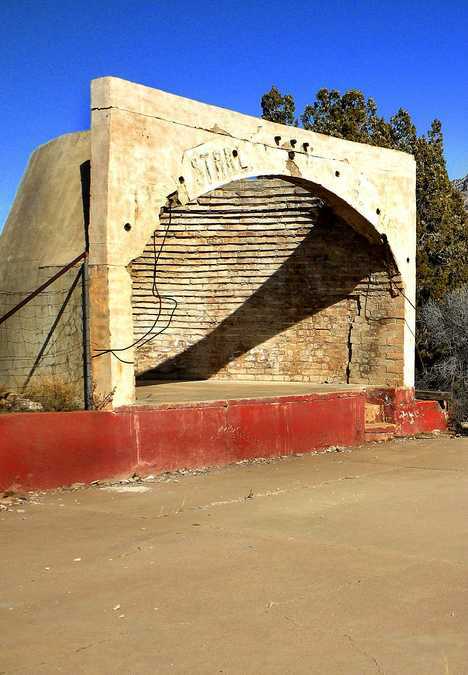 Located between Toquerville and Pintura just off the old Cedar City highway (now I-15), the Starlight was built in the early 1940’s as an open-air dance hall and/or roller skating rink, the latter activity taking precedence as the Big Band era closed. 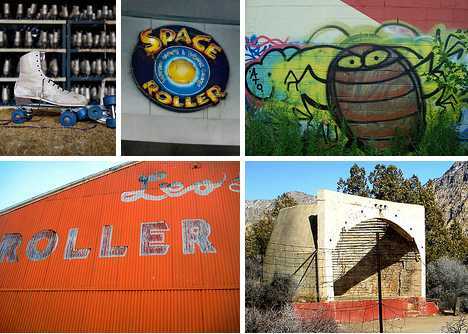 According to the oldest resident of Pintura (likely a former patron), the Starlight Roller Skating Rink was abandoned in 1953 as the Korean War was drawing to a close. 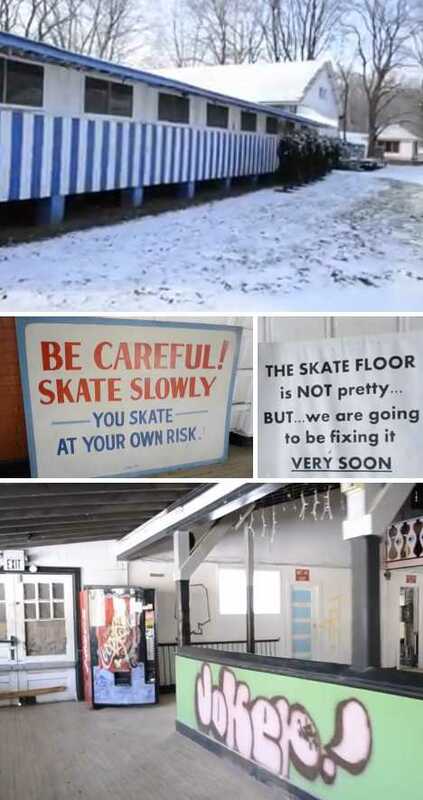 Credit Utah’s arid climate for preserving the facility’s remnants and credit Flickr user Arbyreed for these spectacular photos taken in February of 2010.
Who could imagine a roller skating rink wouldn’t be able to thrive in Calgary, Alberta? Oh, just about everyone: this is CANADA, a place where real skating is done with ice skates and nobody pays for the privilege… during Calgary’s long cold winter, at least. Props to Flickr user Michael Oliver for the disturbing yet delightful image above. Bushkill Park had a good run – the Easton, PA-area amusement park was open from 1902 through 2004 – but severe flood damage inflicted by Hurricanes Ivan and Wilma caused the storied park and its signature roller rink to close pending a massive renovation nobody thinks will actually occur. Almost a decade after the worst flooding in a century, Bushkill Park remains stubbornly comatose. 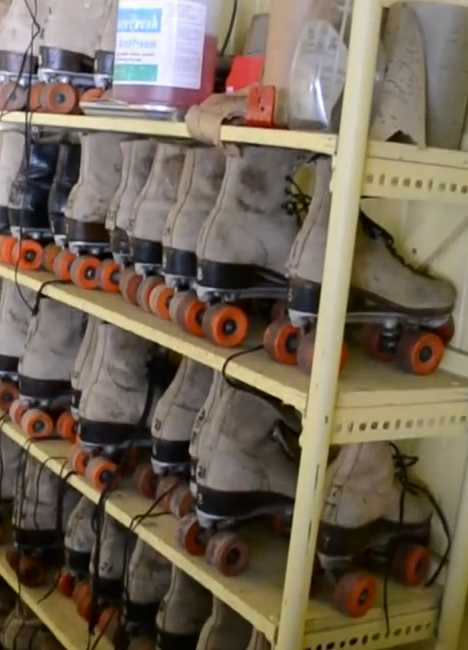 If Bushkill Park’s owners need funds to jump start the clean-up they might try selling off some of the roller rink’s massive inventory of skates before they rot away. Check out this video from TheUnknownCameraman to virtually experience exploring the post-apocalyptic rink. The former Eatontown Roller Rink in Eatontown, New Jersey closed in 2005 and has been quietly deteriorating ever since. Well, not exactly EVER… on February 19th of 2009, high winds caused part of the building’s roof and side walls to collapse. The Eatontown Roller Rink’s rather sudden demise may have been a blessing for its owner, who was planning to demolish the moldering roller rink anyway. Now it won’t take quite so long.